Use of pasteurized eggs eliminates food safety concerns and allows you to enjoy this Bake-Off® Contest favorite. How to make chocolate curls: Chill a bar of good quality chocolate in the refrigerator for a few hours. Then, holding the bar of chocolate in one hand, use a vegetable peeler to shave along the length of the bar to make pretty curls. 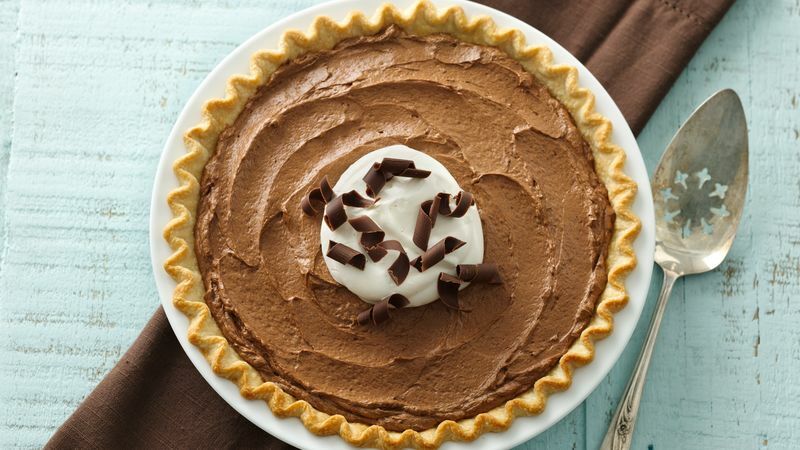 Though its name suggests European origins, French silk pie began in America. In fact, this simplified version of the classic recipe was a finalist in the 1951 Pillsbury Bake-Off Contest, created by home baker Betty Cooper from Kensington, Maryland. Many French silk pie recipes call for raw eggs to make the mousse-like, silky chocolate filling, but this recipe calls for pasteurized eggs instead, eliminating any food safety worries or concerns. French silk pies like this one are often known for their pretty presentation—whipped cream and chocolate curls add the perfect finishing touch. You can also dress up the pie crust to make it extra special! Find everything you need to know about making the perfect pie crust in this easy how-to article and then head over to our chocolate pies collection to choose your next baking adventure!